In episode 24, I interview author Rick Woodford. Rick’s compelling story about how he saved his own dog from lymphoma by simply upgrading his nutrition was the start of a long research project for Rick that resulted in his first book. 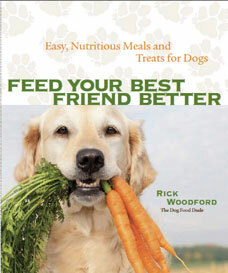 In our discussion today, Rick gives you some quick tips of upgrading your dog’s nutrition right away. How can you start incorporating fresh foods into your dog’s diet quickly and easily? What are the very first steps you should take to improve your dog’s diet?